How Do I Sugar a Lemon Peel for a Garnish? Quick cinnamon rolls are every bit as delicious as traditional. 2 How Do I Sugar a Lemon Peel for a Garnish? No need to wake up at the crack of dawn to have piping hot, homemade cinnamon rolls for breakfast. They'll be ready in a snap when you make a yeast-free dough, thus eliminating the time necessary for proofing the yeast. Yogurt makes for a tender dough that's so close to the real thing -- you may not notice that you used a shortcut. In just 20 minutes, or less if you're quick, you prep the dough, roll it out and pop these treats in the oven. To make the filling, combine the brown sugar, granulated sugar, cinnamon, butter and salt in a small bowl. To make the icing, stir together the cream, vanilla extract and powdered sugar to make a thick creamy coating of spreadable consistency. If it's too thin, add a bit more powdered sugar. Preheat the oven to 425 degrees Fahrenheit. Spray a 9-inch cake pan with cooking spray, or grease with melted butter. In a large mixing bowl, stir together the flour, sugar, baking powder, salt and baking soda. Use a wooden spoon to blend in the yogurt and melted butter. Once the ingredients are lightly incorporated and the dough looks a little ragged, use your hands to knead the dough into a light and soft ball -- about 2 minutes. If it feels too sticky, add a little bit more flour. Turn the dough out onto a lightly floured work surface. Shape the dough into a thick rectangle and use a rolling pin to expand it to about 9 inches by 13 inches. The dough should be about 1/4 inch thick. Spread a light, even layer of filling across the entire rectangle, leaving about 1/4 inch from each edge clear. Start at the longest side of the dough and use your hands to start to roll it up tightly into a cylinder. Work gently; a thin spatula can help coax up any dough that sticks to the work surface. Seal the edges by pinching the dough with your fingers. Use a sharp knife or a pastry cutter to cut the dough into 8 equal segments. Arrange these in the greased cake pan; it's OK if they touch. Bake for 20 to 25 minutes, or until lightly brown and cooked through. Cool in the pan for at least 5 to 10 minutes. Use an offset spatula to spread icing over each cinnamon roll. Pull apart to serve. 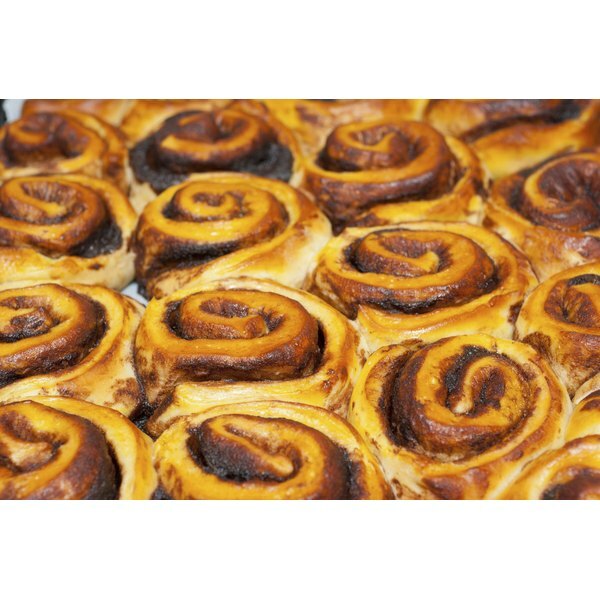 The edges of these cinnamon rolls may appear more unfinished than yeast-based rolls, but this doesn't affect the taste. For smooth-edged rolls, use a long strand of unflavored, unwaxed dental floss to cut the raw dough cylinder into 8 sections.